CHARLES H HADLOCK was born 28 Sept 1840 [30 Sept on death rec] in St Johnsbury, VT [Descriptive Roll; 2nd Marr rec; death rec], the son of Benjamin and Sarah (Hill) Hadlock [mother called Hutchinson on death rec]. He died 30 Mar 1914 in Watertown, MA [MA VR] and was buried in Greenwood Cemetery, Biddeford. 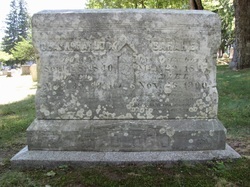 He first married on 30 March 1861 to SARAH E HUTCHINS [Marr Ret.York Cty pg 283], the daughter of Oliver and Mary A Hutchins, who was born in Kennebunkport, ME on 29 Mar 1845 and died in Saco on 26 Dec 1900 at age 55 yrs, 8 mos [ME vr] - grave transcript. says 26 Nov. She is buried with husband in Biddeford. He secondly married, on 30 Sept 1902 in Melrose, MA [MA vr v.526,p.99], to HARRIET C TURNER, the daughter of Osmander and Margaret (Miller) Turner (both born in Nova Scotia). She was born 27 Dec 1854 in Sherburn, MA [MA vr v.82,p.151] and was alive in 1920. She had been divorced from 1st husband, surname Hubeley(sic?). After his service with the 27th ME, he enlisted into the Houghton's Guard, a NH Regiment of 83 men, on 25 July 1864, at age 23. He was mustered out a month and a half later, on 16 Sept, and subsequently the following day joined Compnay K of the 1st NH Heavy Artillery. He was mustered out in DC on 15 June 1865. Charles did not have any children with either wife. Civil War Pension Index: filed as invalid 27 Aug, 1890 [app #934340, cert #656484], widow Harriet C filed 12 Sept, 1916 [app #1022983 cert #817669]. 1870 [parents in Biddeford, haven't located Charles]. 1886 Old Orchard St Direct - lived Highland Ave.
1900 Saco (pg 63) lived Old Orchard Rd, owning home Charles and Sarah married 39 yrs, she having 0/0/ for ch.